Hello everyone! I hope you are all having a fabulous day - and if not, my thoughts and prayers are with you. 1.) Try and understand how they are feeling: I'd say that the first thing to do is to do some research on how depression actually feels so that you can attempt to empathize with them. It will help you not to unintentionally say things that will hurt them. Understanding their experience will be so so helpful because if you understand at least a little bit, you'll know NOT to say things like "Just stay positive! :)"
Thanks to the internet, there is ample opportunity to read up on all sorts of mental health issues. YouTube is also a place where people make videos about how depression feels to them. But also remember that everyone experiences depression in different ways, so I'd try to have a conversation with your person and ask them to try and help you understand. That will also really show them that you care and that they're not alone. But when one is depressed, it's often extremely difficult to put feelings into words, so don't push them and please understand if they say that they can't explain how they feel.
" Hey, I've been feeling concerned about you lately." 2.) Do more research! 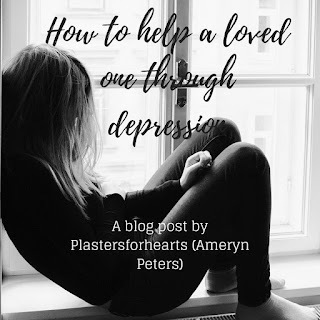 : This tip may seem very similar to the last one, but unlike that one, which was all about empathy and understanding how they feel, this one is more about understanding what happens to someone when they become depressed, so that you can help them. After some research, you'll find that it's difficult for people with MDD to remember to take care of themselves. Even simple things like drinking water, or taking a shower become increasingly difficult. Some things, you might find, are specific to that person and that's okay! Maybe you notice that they always forget to have lunch. Take note of small things like that because depression is often the cause. I'll definitely be doing a post about this kind of thing, hopefully soon. 3.) Surround them with love: Now that you've learned a little bit about depression, you can apply that knowledge in helpful ways. Let's use my example from earlier: If you noticed your friend always forgetting to eat lunch, why not bring them a little snack at lunchtime? Maybe you know that they aren't drinking enough water. Even a small text saying "Don't forgot to drink some water today!" can be really helpful. It's up to you to decide how much or how little you want to do, or have time to do. Now, so far, I've only mentioned physical things. But it's so so important to make sure that they know that you are always there if they want to talk. When you ask them how they're doing, really listen. Listening to them, even if you don't understand what they're going through, makes them feel loved and not alone, which depressed people often are. Knowing that you're there is enough. 5.) Make sure to take time for yourself: Naturally, we want to make sure that the person we love is okay, but we have to realize that we can't help them if we're not okay ourselves. SO if you start to feel that maybe their baggage is becoming your baggage and you are involving yourself too much, it might be time to take a step back. Because as much as you want to help them, YOUR mental health and sanity should ALWAYS be your number one priority. You can't allow your life to revolve around one person and their depression. Unfortunately, often people realize that the relationship has become toxic too late, and end up having to leave suddenly for the sake of their own mental health, and that end up really hurting the person suffering from MDD. I know because I've had that happen to me. So please, I implore you to try and avoid this situation, because it's painful for everyone involved. Remember to always take time for yourself each day to regroup and think and maybe talk it through with your therapist, if you have one. 6.) BOUNDARIES: I know this one sort of ties into the other tips that I've mentioned today, but I really do feel like I have to emphasize this point. You are NOT your loved one's therapist. You cannot be there for them around the clock. Please be sure to set clear boundaries so that the relationship doesn't become all icky and unhealthy and toxic. I know it might feel like you're isolating them, and it honestly might feel that way for them too but in the end it IS the best thing to do, so don't feel guilty about it. Have a good think about the extent to which you are prepared to go for them and let them know. Boundaries are something that I've learned are SO important, especially with all the friends I lost over the past six months or so. I definitely feel that I need to make a whole post about this soon, so don't worry if you feel that I haven't covered this subject enough. I will, promise. Last thing, if you feel they may be at risk for suicide, get help. Now. Even if it feels like you're betraying their trust because they told you and told you not to tell anyone, I'm sure you'd rather have them alive. If you're a teenager, tell a trusted adult or school counselor. If not, there are suicide hotlines all over the world. Reach out to their therapist, doctor, or even parents or spouse and let that person know how concerned you are. So there is actually so much more that I have to say, and so many more tips that I have, but I think this post has gotten too long already so I'm going to leave it there for now. If you want a part two, I would be so happy to write that for you, so let me know! Another thing I'd like to mention is that this post only covered what do to when someone CLOSE to you suffers from depression. What if it's a girl at school who you don't really talk to but know in passing? What if it's an acquaintance? Well, there will definitely be a post about that soon so keep your eyes peeled! I know that I keep on saying "I'll make a post about this soon!" but I really will. I only have time to post once every two weeks though, so you'll have to be a bit patient. In the meantime, you should totally follow me on social media for inspiration on the regular! @ plastersforhearts on Instagram and Pinterest(my boards are sooo nice and organized and it's so satisfying). And I've recently started a Twitter account and it's been so much fun! So definitely follow me there too (@amerynpeters). That being said, I've decided to take a bit of a break from writing about depression for now. I'm glad I've got this series started, but there are also so many other exciting series' and posts I want to do!